We strive to achieve excellence in each and every one of our projects. We hold ourselves to the highest quality standards to ensure that our customers always receive the best possible result. "Settling" is one word that's not in our vocabulary. As language enthusiasts, we recognize the uniqueness of every project we undertake. An assembly-line approach is simply unacceptable for us. 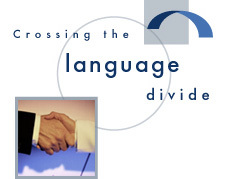 Our highly skilled language professionals listen to our clients' specific needs and act accordingly so that our services are customized to meet each client's requirements. We are dedicated to communicating ideas accurately from language to language while maintaining the intricacies and nuances of the original text. To maintain our excellent reputation, we adhere to the highest principles of honesty and a strict code of conduct in all business practices. We are committed to earning, as well as retaining, our clients' trust.